I MAY or may not have a slight addiction to online shopping (so easy, yet so dangerous.) and one of my guilty pleasures are the deal sites–Groupon, Gilt, Rue La La, LivingSocial, HauteLook….oh yes. I have many online kryptonites. Don’t worry though, I usually merely only take pleasure in browsing, but ever so often something jumps out at me that I HAVE to have. 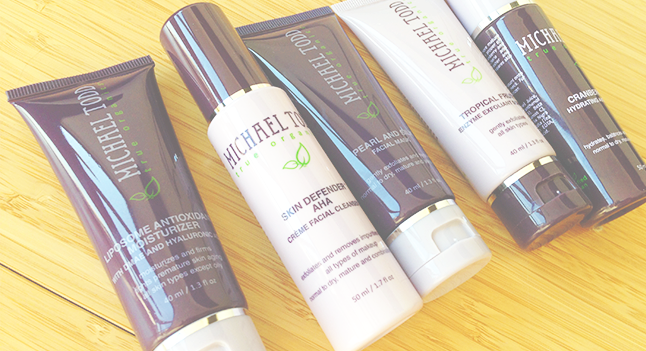 Most recently, it was an anti aging skincare kit by Michael Todd. (which I got for the skincare aspect, not so much the anti aging part since I’m only in my 20s.) Now, to be fair, I have been eyeing Michael Todd products since I’ve seen samples in ipsy– I really like the organic product idea and I have heard pretty good things. So when I saw the kit on LivingSocial for $23 (original price $46) — I snagged it. The following are my (re)views on the kit! 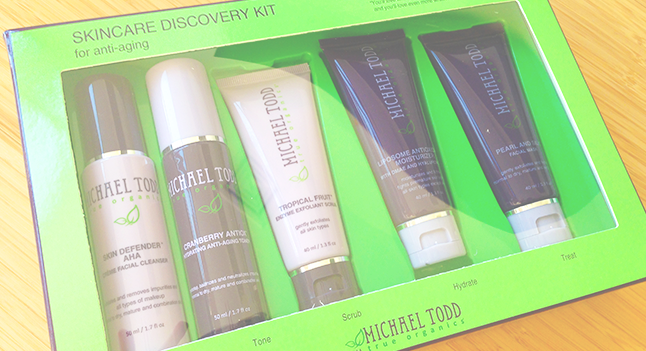 (Note: You can find the exact kit on the Michael Todd website here! (It’s since dropped to $33 on the online store! First up, the Skin Defender Cleanser. I found this cleaner to do the job pretty well, but it wasn’t as tough as some–so I wouldn’t say it would take off my makeup if I wanted it to. The consistency was milky and rubbed on pretty clear. Overall it felt nice and fresh. Next up, the Cranberry Antioxident Hydrating Anti Aging Toner. I actually really liked this toner! It smelt fresh and didn’t feel like it had as much alcohol content as other toners–so it didn’t dry out my skin or irritate it in any way. I would so buy this again. My FAVORITE product in this bundle was the Tropical Fruit Enzyme Exfoliant Scrub –Oh my god you guys, this smelt like a creamsicle on my face!! I was in scented bliss while my face was in exfoliant bliss!! Plus it left my face nice and smooth! This might be my new favorite summer exfoliant! But with the good, comes the bad…and by that I mean the Liposome Antioxidant Moisturizer with dmae and hyaluronic acid. Okay, maybe that is being harsh. The product itself did its job pretty well, it was very moisturizing and not too greasy which is great–but I was not a fan of the smell. Why? Roses. I don’t know what it is about roses, but sometimes when its melded into products a certain way, it just smells like a dying flower bed. The smell killed it for me, but the outcome was nice. SUCH CONFLICT!